In urban localities, home construction levels did not decline as much during the recession as in most suburban and rural localities; consequently, urban localities have had less ground to recover. In some urban areas, such as Richmond and Norfolk Cities, new home construction is at or above the levels of the housing boom. This can be seen by scrolling through the slideshow above. Nationally, similar trends are also noticeable. During the recession, construction evaporated on the edges of metro areas, such as Atlanta and Chicago. Though there was an uptick in home construction in many metro areas’ suburban counties during the past year, much of new home construction has remained at the center of metro areas since the start of the recession. In the Northeast and Midwest there has been little recovery in home construction. 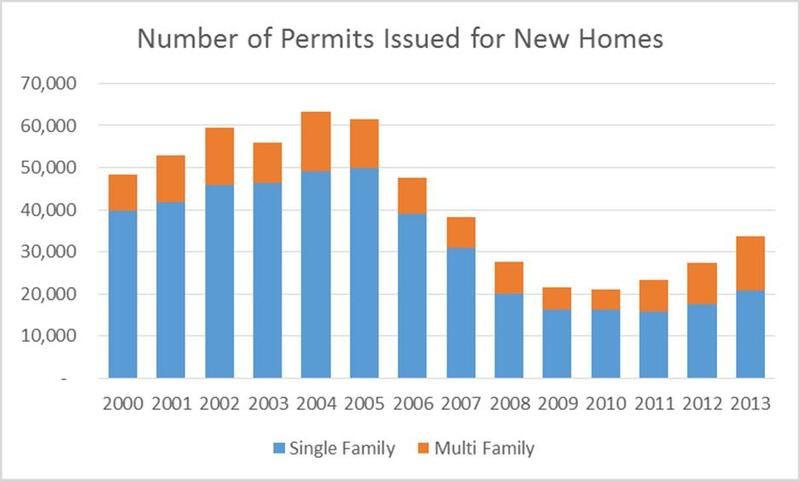 Despite the strong increase in Virginia’s home construction during the past year, the number of building permits issued for new home construction remains well below the number needed to house a growing population, as it has since the housing boom fizzled in 2005. Since the end of World War II, Virginia’s population has grown at a steady pace, adding around 700,000 to 900,000 residents each decade. In order to house this growing population, about 50,000 homes on average were constructed each year during the period. But in the early 2000’s, as home prices in Virginia doubled within a few years, developers built more homes to meet demand. Likewise, many home buyers moved out to rural counties where their money could go further, causing a spike in new home construction in most rural areas. 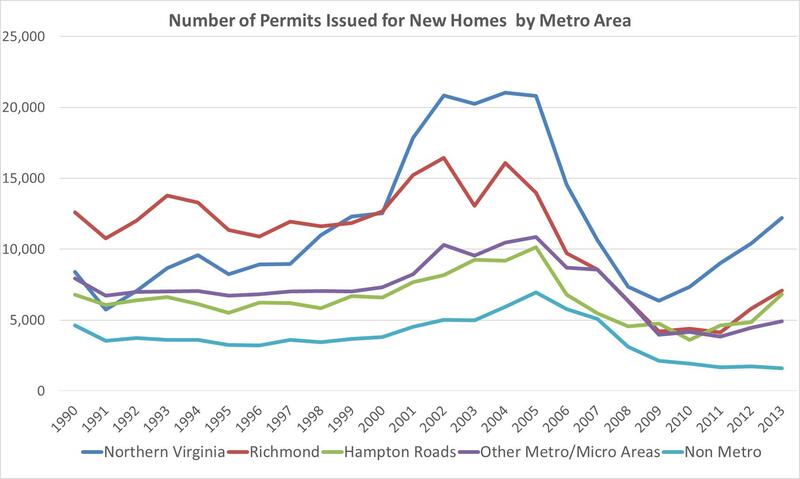 The end of the housing boom in 2005 and the mortgage crisis that followed brought about a strong correction in home construction with the number of building permits issued in Virginia falling to less than half of their long term annual average of 50,000. When the recession ended in 2009, home construction started to rebound immediately in Northern Virginia. But, in other metro areas, home construction only began to rise in 2011, after home prices rebounded. In rural counties, outside metro areas, home construction has continued to decline. Even though home prices have risen — earlier this year reaching 2005 levels in Virginia — home construction has been slow to recover. With stricter mortgage requirements and higher home prices, it remains difficult for many to buy or sell homes. In 2012, only a third as many homes were bought in Virginia than in 2005. Without the demand, developers are building fewer speculative homes, while some are building apartments to rent out instead. Meanwhile Virginia’s population has continued to steadily increase and is on track to add another 800,000 residents this decade. If home construction had kept pace with population growth since 2005, there would be 130,000 more homes in Virginia, even when accounting for the higher construction levels during the housing boom. This shortage of housing has forced many people to live with family members or find housemates. Another side effect of the housing shortage has been a shift of population growth into larger urban and suburban areas, where there is a greater number of housing units available to rent and buy. Likewise growth has dwindled in rural areas and along the outer edges of metro areas, where most growth came from new construction. Even as home construction steadily recovers, the number of permits issued for new construction remains well below the number needed annually to house Virginia’s growing population, only adding further to the housing deficit. Given the economic and regulatory challenges to the housing industry, it is a stretch to believe that home construction will soon return to the boom levels of the early 2000’s. But, in fact, those levels might be what is necessary to eliminate the housing deficit.